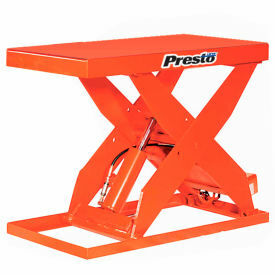 PrestoLifts&#8482; HD Scissor Lift Table XL36-50F 48x24 Foot Operated 5000 Lb. PrestoLifts™ HD Scissor Lift Table XL36-50F 48x24 Foot Operated 5000 Lb. Ideal for handling bulky heavy materials. Maximize worker and machine productivity by hydraulically positioning work at just the right level. Raise or lower to feed or accumulate from machines or conveyor lines. 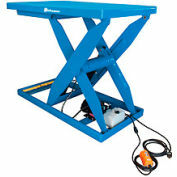 Ideal for handling bulky or heavy materials. Raise load to desired position to prevent back injuries, caused by heavy-duty tasks like lifting and bending. Heavy 3/4" plate steel scissor legs. Maintenance chock included to ensure safety during routine inspection and maintenance. 1-1/2 HP three phase 220V motor has junction box and low voltage transformer. Note: 220V Motor is standard; optional 460V Motor is available upon special request.